It is better for you to make your own path or road.Doing things with your own unique style can bring innovation to something old. 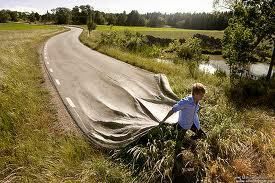 You may not need new tools to develop your road. Just use the ones you have already and they will serve you well. But be careful not to wait too long. For if you do, someone else may just come up with the same idea and launch it before you do. Leave procrastination for those who do not believe that tomorrow is the day that never comes. Give more service than is required and you will receive tenfold!